Avengers: Endgame is going to be stacked from the ceiling to the floor with just about every major Marvel character introduced on the big screen in the MCU over the past decade. So anything is possible, right? Especially with the introduction of time travel. Not to mention furious rumors of flashbacks crowding the landscape. So, perhaps the latest Endgame theory isn't so far-fetched as it may seem on the surface. The Super Bowl trailer for Avengers: Endgame doesn't give us much, but as it is pulled apart and picked over by eager Marvel Cinematic Universe fans with nothing better to do while they await the sequel's arrival at their local cineplex, some new ideas and theories are coming to light. And this latest one deals directly with the scene were we see Jeremey Renner as Ronin. The theory seems to suggest that a major villain is coming back for the most anticipated movie of 2019. 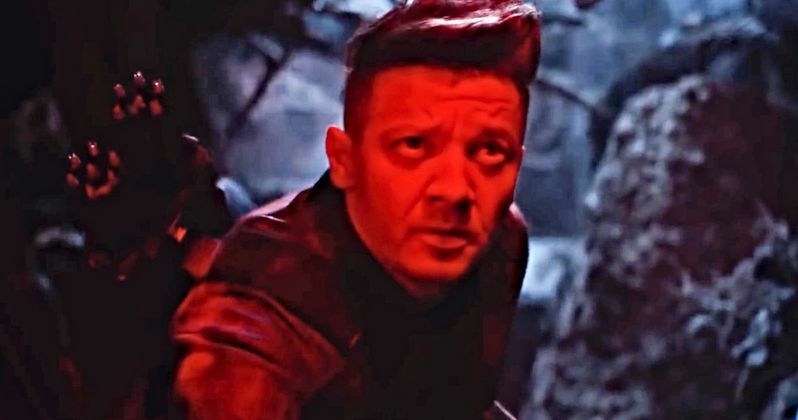 One MCU fan points out that when Jeremy Renner's Ronin is spotted in the latest Avengers: Endgame trailer that there is a red light reflecting on his face. The expression on the character's face doesn't appear to be a welcoming one, which has led to speculation that Renner is facing Ultron. According to the fan theory, there are only two characters who show off red light when using their powers, which are Scarlet Witch and Ultron. Considering the look on Ronin's face, it appears that he is facing a foe and not an ally. As for how this all happened, it's believed that Ronin goes on an intense manhunt to find as much information as he can on the Decimation. Ronin's quest for information may have led him to Japan where he fights the Yakuza. It's here that the fan theory believes that Ultron is involved by controlling the Yakuza. It's a pretty decent theory, but obviously, it has yet to be confirmed. It is also possible that the time travel elements of Avengers: Endgame could bring back Ultron. The villain's name has popped up more than once over the past several months, especially since Red Skull was brought back in such a secret manner. The Russo Brothers could have brought Ultron back for Avengers: Endgame, but did they really tease the villain's return in the latest trailer? It's believed that Ultron is still alive, so he could very well make a return in Endgame. But, is this something that MCU fans are going to want to see on the big screen when the movie hits theaters in April? The Russo Brothers love to misdirect and pull out surprises, but it seems unlikely that they will pull off another reveal like Red Skull, at least in that limited cameo way. As with anything Marvel Studios does, everything is being kept under wraps for the time being. You can head over to Reddit for more information on the latest Avengers: Endgame theory.